At a formal event held in a space decorated for the occasion in the Barça colours, Josep Maria Bartomeu, president of FC Barcelona, and Ken Chu, president of Mission Hills Group, have signed an agreement that will unite the two organisations for the next ten years with the option of extending the deal for a further decade. 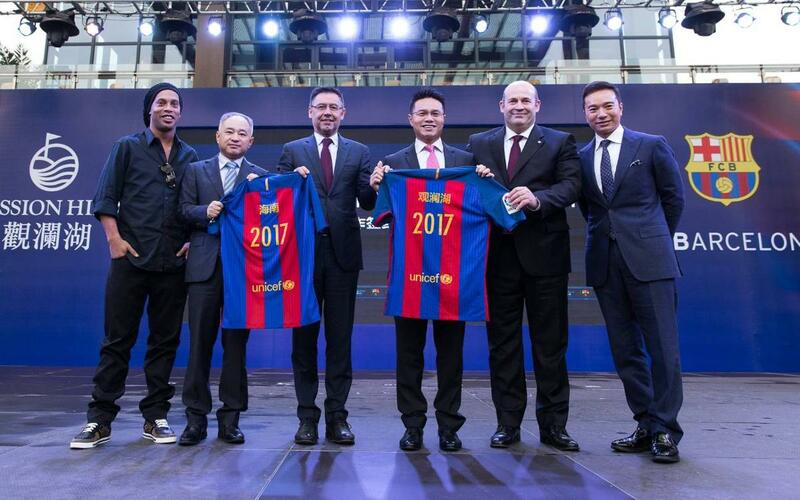 Through this agreement, the two parties will be building the first ever FCBEscola to be fully run by the Club, with seven training pitches and the capacity for a thousand boys and girls, as well as a Barça experiences area in Haikou, the capital of the Chinese island of Hainan. The deal was endorsed by the members at an Assembly and means a new step forward for the Club’s global positioning process, as laid out in the 2015-2021 Strategic Plan. FC Barcelona’s institutional visit to Hainan has been raising extraordinary media expectation. More than 350 media workers received passes to follow the formal signing ceremony, which was followed by a press conference. Afterwards, Bartomeu and Ronaldinho left their hand prints on the ‘Walk of Fame’ at the Mission Hills Resort, where they will appear alongside top golfers Tiger Woods, Colin Montgomery, Nick Faldo and Greg Norman, as well such other sports personalities as Michael Phelps, Allen Iverson, Yao Ming, Boris Becker and Ronaldo, and movie stars including Michael Douglas, Catherine Zeta Jones, Ryan Reynolds, Andy Garcia and Hugh Grant. Once the signing ceremony was over, the Chu brothers took the Barça entourage, led by president Bartomeu, Ronaldinho, and CEO Òscar Grau, to the site, still under construction, where the Barça experiences area is to be located. The park will include an interactive area about Barça history, a Megastore and a catering zone, all of which will be opened shortly. They then visited Movie Town, where a huge number of Chinese movies are filmed, where they were able to watch a series being recorded live. They also visited the column-less indoor cinema studio – said to be the biggest in the world. Prior to the signing ceremony before the reporters that gathered in Centreville, Haikou, president Josep Maria Bartomeu and CEO Òscar Grau, along with the rest of the Barça party, paid a visit to the headquarters of the Hainan Government. They were welcomed by a group of senior officials from the region, led by governor Liu Cigui, who told them all about the island, stressing its environmental sustainability and the 60 million or so visiting tourists that it receives every year. He also revealed further details about the sports facilities at Hainan, including the golf courses and resorts that are still being built. Bartomeu, in turn, spoke about what Barça and its history are all about, as well as presenting details of the project that’s being developed at Mission Hills. The club president also invited the governor to come one day to Barcelona to see a game in the stadium. He also spoke about the possibility of the women’s team travelling to Hainan for part of the preseason, and playing a friendly while they are there. “We are here today to share with you the first fruits of a historic partnership. We shall work with Mission Hills to make Hainan a football centre for China and for the region in general”. “With this goal in mind, we are bringing our football academy here to Haikou. This will be our first school fully managed and supervised by the club. We are also opening an interactive FC Barcelona experience area, the first one outside of Barcelona, where visitors will be able to find out what it feels like to be part of one of the most widely-loved football clubs in the world”. “We are aware that Hainan is a province that wants to lead the way into the future. It is already one of the top tourist destinations in Asia, thanks in part to the enormous investment made by Mission Hills in golf courses and other infrastructures here”. “This is the material that dreams are made out of. And that is the most important thing that we are doing with Mission Hills here in Hainan. The vision of China being a great footballing nation will gran drive the dreams of young people, who so admire players like Ronaldinho. And our goal is to help to make those dreams come true”. “Finally, I would like to thank Mission Hills for helping us to bring FC Barcelona to China. It is an honour and a privilege to be here and to play a part in its footballing future”. “China has a footballing dream. It is a huge honour to be able to work with Barça, which is famed for having the best training system in the world, and for it to be coaching the future talent here in China”. “We are very pleased to have one of the biggest training facilities in the world, with 29 pitches, both indoor and outdoor, and to work together to build the greatest platform for coaching the finest talent”.